While formulating your company’s marketing plan, it’s important that you don’t overlook the benefits of participating in a trade show. On the surface of it, trade shows may seem far too expensive, but the benefits definitely outweigh the costs. In fact, most companies allocate roughly 32% of their marketing budgets to trade show events and other exhibitions. Irrespective of whether you’re a trade show veteran or a novice exhibitor, it’s vital that you get your trade show marketing budget right at every event. Your budget is the crucial element that will decide what kind of booth you can afford as well as what kind of other marketing collaterals you should spend money on. When you partner with the event organizer as a sponsor, you ensure that your company’s brand name is front and center all through the duration of the show. Of course, choosing to sponsor an event can be quite expensive, so it’s imperative that you carefully weigh out the benefits and the costs. Generally, the biggest sponsorship opportunity will be provided to you by the event organizer itself. However, they generally have a fixed rate card which they use to ensure that they can maximize their profits. But, this is precisely where you have the opportunity to negotiate and strike a deal that will benefit not just your company, but also the organizer. To be able to do this, you will need to do a little research. First, you will need to check the information that the organizer provides you with regards to the kind of audience that will be attending the event. Next, look at the records of the previous events that the organizer has executed. Were all the partners happy? Did it lead to successful conversions for the companies exhibiting? Was the previous sponsor able to increase their profits? These are a few important things to consider before you decide whether or not you’d like to be one of the sponsors at the trade show. If things are looking good so far, then it’s time to get into the nitty-gritty You need to decide how much you’re willing to spend on the sponsorship deal. Ideally, it shouldn’t be more than 10% of your marketing budget. On the other hand, if you’re really pressed for cash, you can pour more money into the sponsorship deal and cut back on the size of your booth. While a purchased booth is often the dream, opting for a booth rental can seriously reduce the pressure on your budget. Purchasing a booth can be expensive, and they come with additional costs of insurance, repair, monthly storage, regular maintenance and more. On the other hand, rentals clock in at barely 30% of the cost of a purchased booth. Additionally, the rental company will look after not just maintenance and storage, but also shipping your booth to the event venue and installing it for you. If you’ve chosen your partner carefully, the company will also provide on-site assistance through the duration of the show, ensuring that you never have to deal with any kind of last-minute issues by yourself. But the benefits of a rental don’t end there. When you decide to rent a booth, you gift yourself the power of flexibility. You can change your rental booth’s size and design at your first few shows until you find something that works well for you. You can create a new and completely customized booth each time, which is sure to draw in repeat visitors. While you can cut a few corners when it comes to the size of your booth, or even the number of freebies and handouts you’re willing to give customers, you absolutely cannot compromise on your booth’s display. The kind of materials that are used to build your booth will greatly impact the way that potential customers interact with you and your booth. It’s vital that you design your booth in such a way that it’s easily visible, even at a crowded event. Think about where you want to place your tables and your standees. Consider the possibility of having an audio-visual stand where you could play your marketing presentation. Before you start to design your booth, it’s imperative that you outline your trade show goals. This will greatly influence the kind of elements that you will need to incorporate in your booth. If you’re attending with the sole intention of releasing a new product or promoting older products, then you’ll have to incorporate a live demo station in your booth’s design. This should be the main element that you build your display around. On the other hand, if you’re attending in the hope of signing new clients, a private meeting space may be far more important. Once you understand what kind of elements you need in your booth, it becomes easier to sort out the design. Always remember to keep your booth open and spacious – this will invite more customers in. To bring your design to life, it’s crucial that you select good quality materials and fabrics to build the actual booth. If you spend a little time out in the market, you’ll definitely be able to strike a deal for good quality at a reduced price. 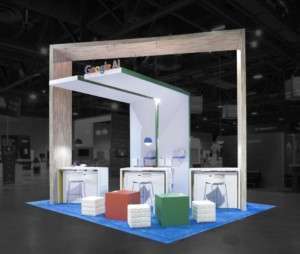 Depending on the kind of business you’re in, you can even consider using natural elements like wood to add a whole other dimension to your booth experience. It’s these small things that could help you enjoy a successful trade show and get the most bang for your buck. First things first; while choosing the staff to man your booth, it’s important to exercise caution. You may be able to find hosts and hostesses who have excellent communication skills and dress impeccably, but if they don’t have any knowledge about your company or your products and services, this could be a dead investment. Instead of outsourcing this work, ask your own employees to volunteer at the booth for a bonus. Not only will this work out to be cheaper for you, but it will only enhance your customers’ experience. When guests walk into your booth, your team members will be excited to invite them in and talk about the products, services, and company that are proud to be a part of. While good staff will definitely boost your booth’s footfall, it may not be enough for you to achieve your goals. For a foolproof marketing plan, you also need to think about providing customers with a memento or freebie. No, we aren’t talking about pens or flash drives with your company’s name stamped across it. Instead, consider handing out t-shirts that have your logo incorporated tastefully as part of the design. Along with this, you could also have a couple of members of your marketing staff circulate the floor to hand out your brochures, visiting cards and perhaps even fridge magnets. If you don’t have the budget for a range of giveaways, consider holding a raffle with a single, slightly expensive gift – like a tablet or a free trial run of your products and services. Trade show attendees are always hoping to receive freebies, and with a big prize up for grabs, you’ll have a number of people rushing to your booth to enter their names in the draw. In the months leading up to the trade show, tease your participation across your social media pages. This will whet your clients’ appetites, and even if they aren’t able to attend physically, they’ll definitely help spread the word. You can also use paid social advertisements to reach a wider audience. This may cost you a little bit, but it’s definitely more cost-effective than buying space in a newspaper or on a billboard. To create a real buzz about your participation in the trade show, consider doing live video streams on your preferred social media website. You can give your customers a sneak preview of your booth and the kind of freebies you’ll be handing out to get more people interested. You could also have senior management employees answer questions that individuals may have about the work that your company does. All this will help get people involved with your company and your participation, and it hardly costs anything to pull off. In the weeks before the event, you can send out personalized e-mail invites to your client list. If you have a few VIP clients, consider visiting them to personally invite them to the trade show. It’s important to have established customers attend the show with you, as they end up promoting your brand and pointing potential clients in your booth’s direction. These are just a few strategies that you can employ to ensure that you make the most of your trade show marketing budget. While coming up with your marking strategy for the event, it’s imperative that you consider what kind of ideas will work for you and your brand. Good luck.